For future updates please check out my portfolio website for all new details and clips. 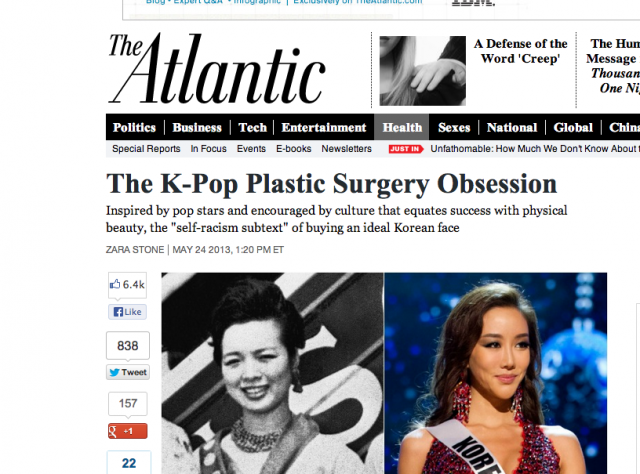 Story published on the Atlantic. -The MedFolio Wireless Pillbox lets relatives know if you’re taking medication correctly. 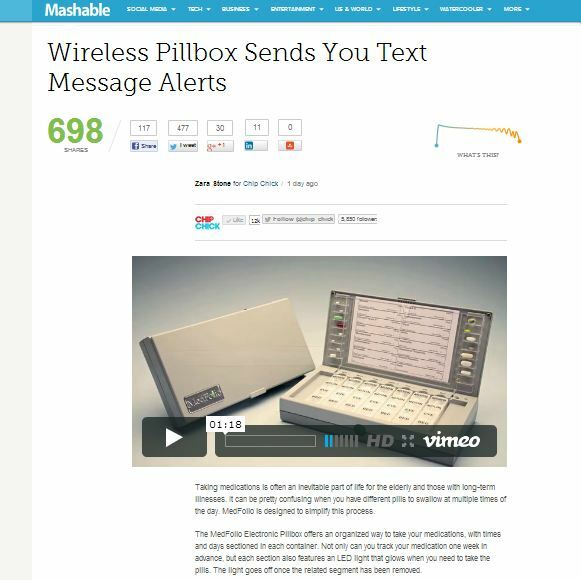 Wrote a news story about the release of this at CES, which was then republished on Mashable. -Covered the Consumer Electronic Show 2013 in Las Vegas for ChipChick and produced daily news stories. Some of the stories can be read here. -Spoke on BBC Radio Home Counties about the US Election results and how New York was reacting at the time. 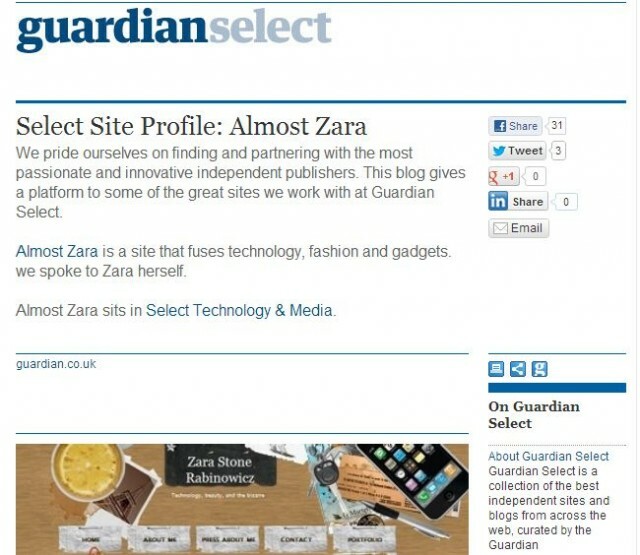 -AlmostZara Blog chosen as Guardian Select Website of the Week. -On the Lauren Laverne Radio show on BBC 6 Music, speaking about Apple creating their own maps and Facebook’s new App store on Planet of the Apps. 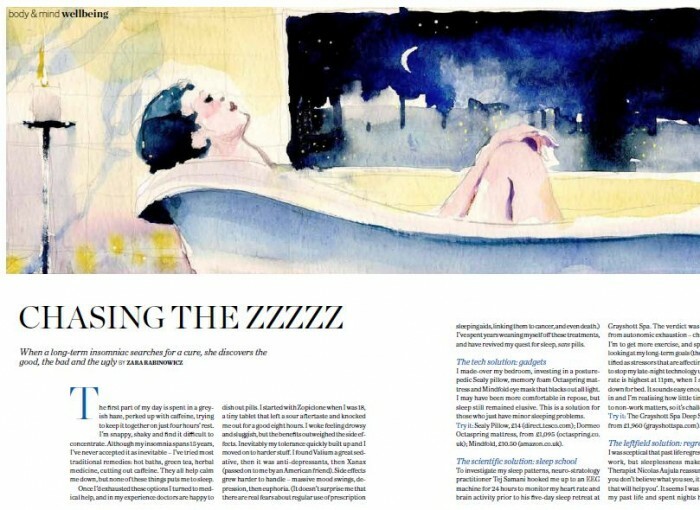 -My article on Insomnia was published in Psychologies Magazine. Read all about it here- My Sleep Story. -Quoted on MyPure talking about how food affects the skin. – I was a speaker at the iFabbo London Social Media Conference : I gave my talk on how to use social media to build a brand and engage with bloggers and there was a very lively discussion. Key points were around authenticity, trying not to ‘do it all’, and being clear what your long term strategy is. 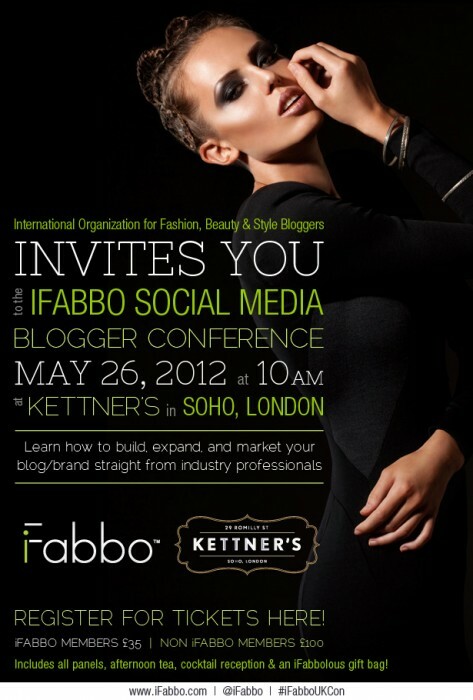 –Have been confirmed as speaker for the iFabbo Social Media Blogger Conference in May. – I’m now an Expert Blogger for the PriceRunner Switched On Tech Blog. I’ll be sharing web trends and gadget news and analysis here. -Spoke on NRA News about Girls with Guns, and how there needs to be more education and less titillation about female gun ownership. Watch the video below. 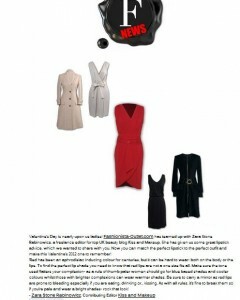 -Quoted in the Fashionista Outlet talking about Valentine’s Day trends. -Quoted in the Collective Review talking about Fashion Week Beauty trends. My fellow FashionWare presenters, from L-R; Sharon Vaknin; CNET , Beth Blecherman ;TechMamas, Jennifer Jolly; ABC/ Tecca, Linda Nessim, Andrea Smith; ABC News Radio, Me!, Helena Stone; ChipChick.com, Suzanne Kantra; Techlicious ( a few are missing from this image, so a shout out to Judie Lipsett Stanford of GearDiary and Mia Kim). 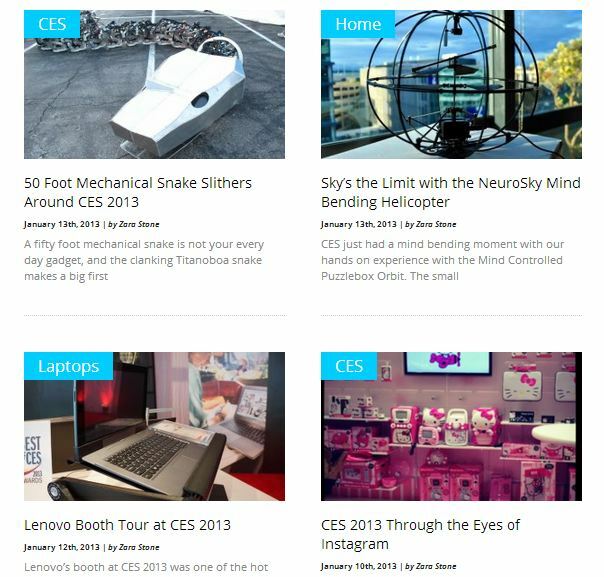 – Presented and curated the FashionWare show at CES 2012 in Las Vegas, where fashion meets technology. I narrated and presented as my high tech model made her runway debut in a Rainbow Winters creation, and also consulted with the organizers as to the inclusion of various technology items in the show. -Appeared on BBC World Service news discussing consumer electronic trends in television from CES 2012- reporting from Las Vegas (clip to be uploaded). -Quoted talking about celebrity makeup trends on Candis and MyPure and Yell and Sleek MakeUP. -Was quoted in Psychologies Magazine as a technology expert regarding gamification and the growing trend amongst women to play. -Talking about makeup trends on My Pure and surgical treatments on Spiral healthcare. -High Tech Ways Prisons work nowadays on ChipChick. 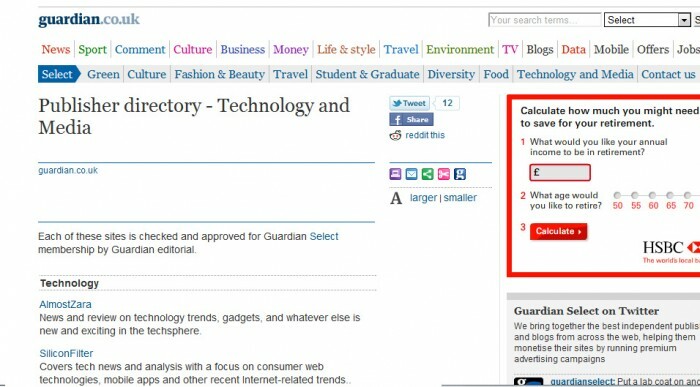 -Have been accepted into the Guardian Select Technology Blogger network, which means I’m now affiliated with one of my favourite publications. -Travel piece in the Guardian section about the growth of urban farming and related activities in the UK. -Quoted discussing how people should obtain proper advice before undergoing laser or cosmetic surgery treatments on Candis, Contact Lenses UK and Spire Healthcare. 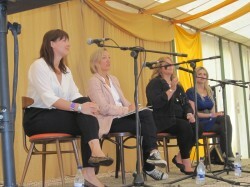 -Spoke on a panel at the Wilderness Festival with Clare Longrigg from Psychologies Magazine about friendship in the digital age. You can read a lovely write up of it on the New Scientist here. 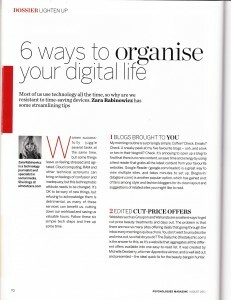 You can also read the write up on Psychologies Magazine Website here. 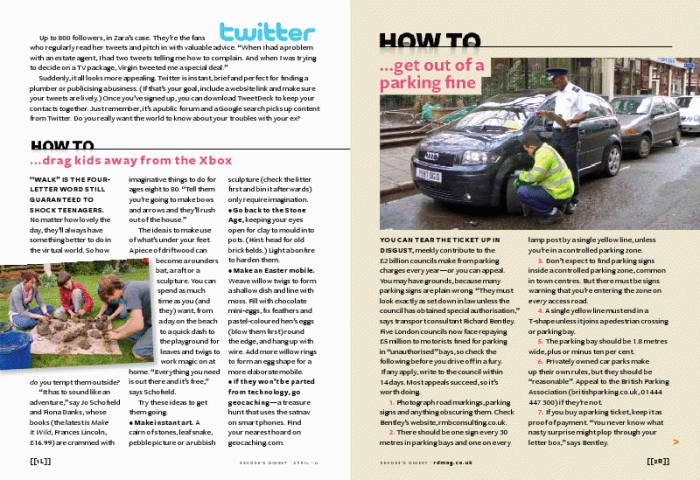 -My Twitter account mentioned in Readers Digest as an example of how to attract people to visit your website. 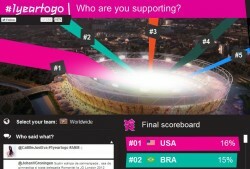 -Working with the London 2012 team I project managed and creatively advised on the 1 Year To Go Digital asset campaign which involved creating a online digital Olympic stadium of Tweets and an interactive video map of the world. This gained coverage on major news outlets such as Mashable and Technorati and had over 80,000 participants get involved on the specially created #1yeartogo hashtag. You can watch a snapshot of this below. 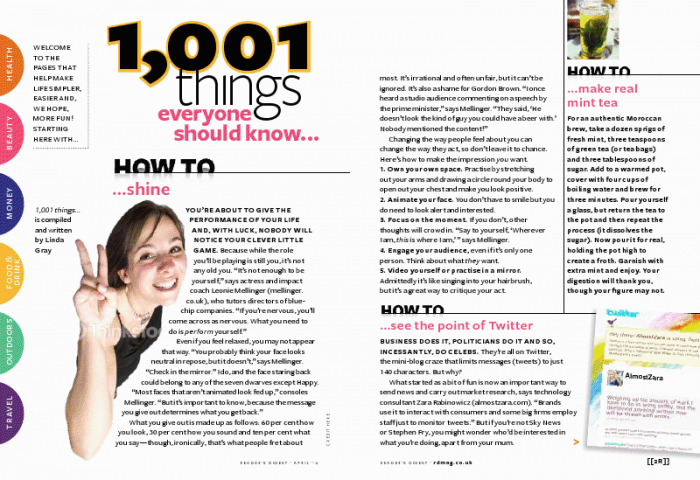 -Interviewed by Gorkana and shared tips on how to handle blogger outreach, PR mistakes and what makes a good pitch. -Two slots on SKY NEWS assessing the morning papers. One was 5 minutes, ones was half an hour (eep!). Clips to be uploaded soon. 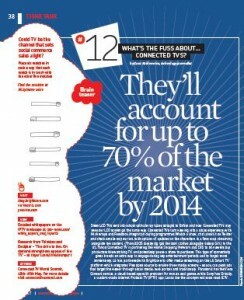 -Wrote about Connected TV’s and how they will impact on commercial activity for Contact Magazine. Read the full article here. 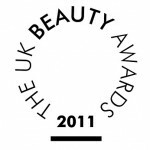 -I have been chosen to be a judge in the UK Beauty Awards 2011. which will take place in December at the Clothes Show Live. -Happy Mother’s Day (if you live in the USA). Here I celebrate top ten mothers of the world, in fields of science, technology and geek lore with my column on Chip Chick. -Top Ten Techie Hotels- which one would you like to stay in? Find out on Chip Chick. 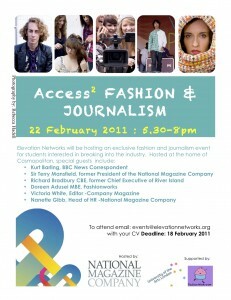 -Talking to students at London College of Fashion at an Access 2 Fashion and Journalism event about how they can get into journalism. Topics involved maintaining an online presence and how to get started in blogging. -Helping women find the right organic moisturiser on MyPure, and sharing how makeup will be playful this springtime. -Seasonal beauty shades and summer trend on the Big Green Smile. -Discussing with Computeach the rise of hyperlocal sites and what this means going forwards. Presenting the Fashionware show in Las Vegsas. This month I attended CES 2011 in Las Vegas, and was one one of the presenters in the FashionWare Show. 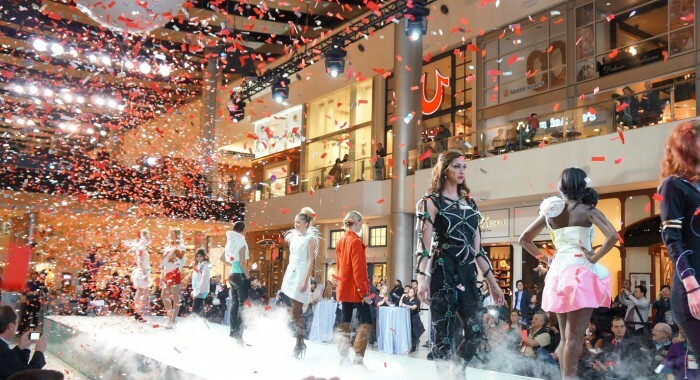 The Fashion Show took place on Jan 7th in the Fashion Show Mall, and combined tech and style with women draped in light reflecting diode dresses whilst carrying their tech essentials from tasers to solar powered solutions. I was honoured to be on of the presenters, as my fellow attendees have serious clout in their field, such as Helena of ChipChick fame, Suzanne Kantra from Techlicious and Natali Morris from CNET TV (and many more). My model was the LivingWare Mom, bedecked in a electroluminescent dress with a pretty pink Taser for added appeal. I wore my biggest heels and still looked like a pygmy. Find out more about the FashionWare story here, or check out this great feature here for more info. -Talking about how mobile technology is integrated into British culture, and how mobile applications aid this in Direct Marketing Association, Computeach, BMSCommercial , Equimedia and iHotDesk. -I was on the PR Week videocast discussing PR and Beauty Blogger relations, and how the two can work together cohesively. Watch it below. -Quoted talking about why beauty treats are important on MyPure, Yell and Big Green Smile, and Look Fantastic. 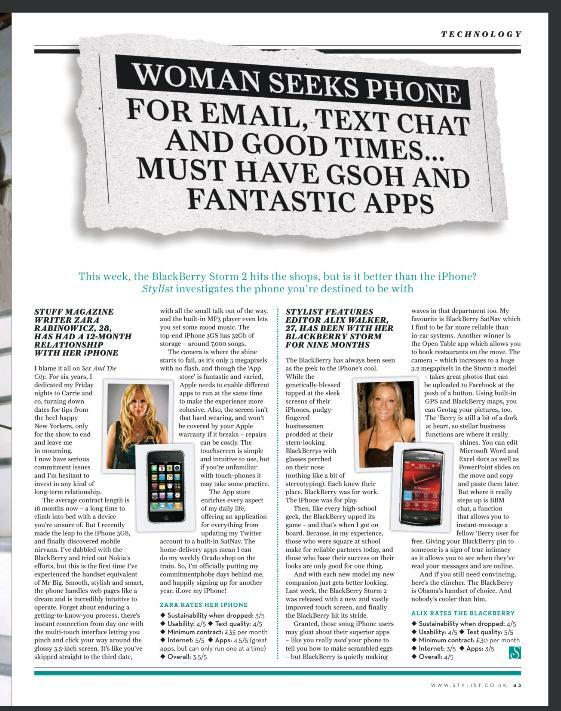 -In Prima Magazine discussing how to conserve computer power and maximize battery life (clip to come). I was in a video created by LocalPeople (a subset of the Daily Mail) discussing how hyperlocal websites can engage a local community. Watch it here- Local People Filmed Intro (click the link to download and watch). -I advise Barry M readers on how to wear purple eyeshadow. -Discussing how green products can be effective on on Yell.com, Look Fantastic, L.K.Bennett and Journalism.co.uk. 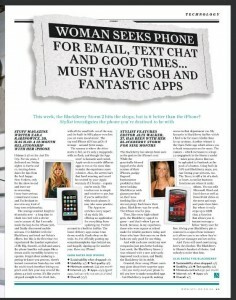 -The latest Tech from a Small Island column on ChipChick, discussing Katie Price’s iPod range and the Fashion Blogging Song. -Giving my red carpet ready tips to the readers of OSOYOU. -Google Instant recognizes my name! Yes, really! This is what Scott Douglas of Black and White and Read all Over discovered. The lack of updates here isn’t because I’ve been off enjoying the sun, more that I’ve been working so hard I haven’t had time to pimp out my various pieces on the web. Here are a few for you to catch up on. -Talking about Twitter in Reader’s Digest Magazine, yes, Reader’s Digest- it’s much cooler than you were led to believe by your Gran. 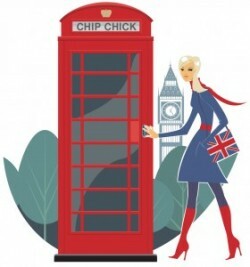 -I’m the European correspondent for the great USA gadget website www.ChipChick.com and you can see some things I’ve written here and here. I LOVE the cartoon they created for me! – Six reasons why we’re disappointed with Apple’s iPad on Latest Gadgets. -Top Five Frozen Yogurt places to visit in London on the LeCool blog. -I’ve been baring the contents of my makeup bag on Lotions and Potions. -Not really doing anything but nice to be style spotted all the same. -Talking fashion and beauty trends with Bip Ling at Live From Fashion Week. -SKY News appearance discussing Facebook friends and anti-ageing discoveries. 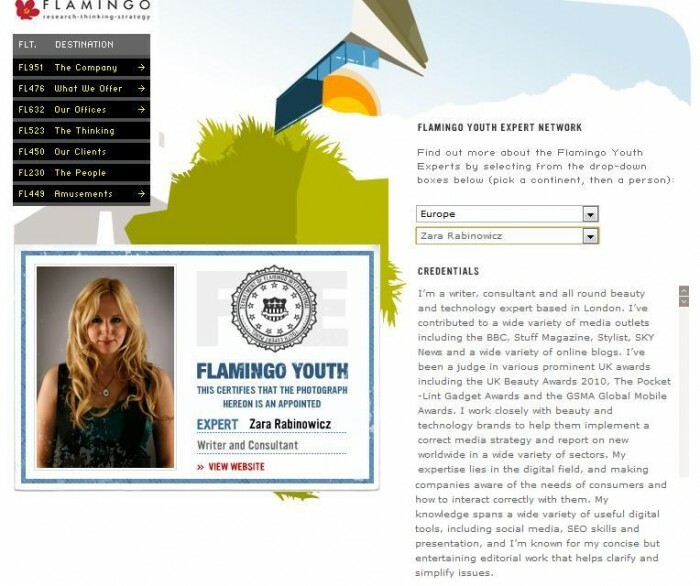 –I’ve just been confirmed as a Flamingo Youth Expert for Europe for Flamingo International, a great company that works on social media trends, digital analysis, research and marketing campaigns. I’ll be working for them as a consultant, advising on everything from product strategy to how to successfully reach out to bloggers. -Just realized I hadn’t updated you on my latest web shenanigans, due to Christmas holidaying and January detoxing. I was quoted on MyPure, and ICS Learning discussing how women are getting savvier with their product purchases, and how products need to be more effective. I’m discussing beauty trends for 2010 on Yell.com, the Avon blog, Thanks Darling , Online Bingo Friends, and Pink Ladies . -SKY News appearance discussing Perez Hilton’s diva moment and that Tesco will be selling the iPhone on a £20pcm 12 month contract! -Added another string to my ever growing judging bow, and was one of the judges for the Pocket-Lint Gadget Awards 2009. Very happy that the HTC Hero and Eye-Fi came out trumps, as both are great devices. 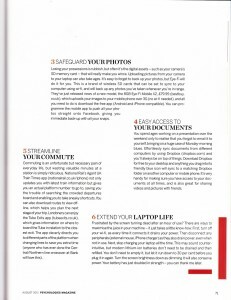 -Quoted in this months Reader’s Digest extolling the virtues of Spotify. -SKY News appearance discussing Google Street View and cyber-bullying. 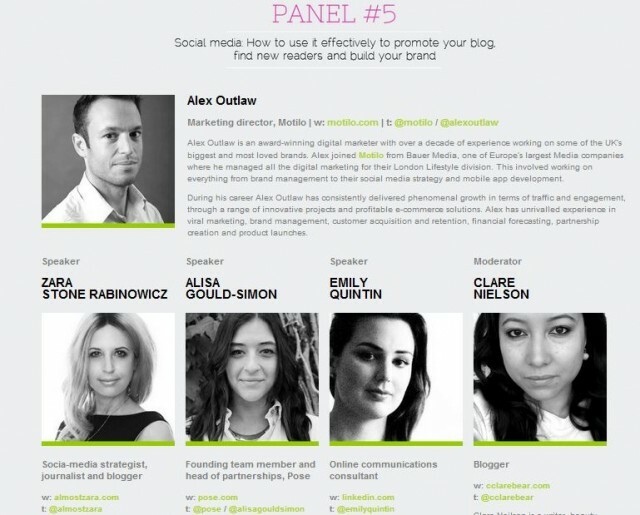 -Officially on the judging list for the Global Mobile awards 2010- scroll down here and you’ll see my name- and they’ve even spelt Zara Rabinowicz right (you’d be surprised how rarely that happens). –Whilst this isn’t strictly press ABOUT me, I had my first piece published in Stylist magazine Issue 3, and decided to share it with you. Click on it to enlarge! -Have also been asked be on the shortlisting panel for the UK Beauty Awards 2010 (hosted by the Clothes Show) , so will be testing products soon. -Have been asked to judge the Mobile Gaming category for GSMA’s Global Mobile Awards 2010. It was great fun last year, so looking forward to doing it again. -Spoke with Dave Monk on BBC Radio Essex about what to look for in a camera.Audio clip coming soon. -Quoted on Women In Technology , Teleappliant , BCS, Broadband Finder, and Mobile Shop commenting on how people feel anxious when cut off from the Internet. -SKY news appearance discussing Chessboxing and Shakespeare. -Quoted on Look Fantastic, Net Mums, Ladies888Bingo, ABC Pharmacy , and Active You advising on how to adjust your skincare routine for the changing season. -SKY News appearance discussing dangerous biscuits and Google’s Monopoly Cities. -Spoke on the Richard Bacon show on BBC Five Live about the best gadgets of the last decade. Think Wii, Apple and the rise of smartphones, netbooks and social networks. Audio Clip coming soon. -Spoke on BBC Radio Essex about how to keep your feet in good condition during the Flip Flop months. Top Tip? Use Bliss Softening Socks overnight!Audio Clip coming soon. -Quoted on Look Fantastic, Thirty10, Avon UK, and the Yell.com blog discussing how to keep your hair protected on holiday. -SKY News appearance discussing Jude Law and Twitter foul-ups. -Spoke on BBC Radio Essex about how to use mobiles abroad: Top tips would be activating roaming, only using Texts and getting Vodafone’s Summer Passport. Audio clip coming soon. -Appeared on SKY News talking about real life Transformers and Rent a Guests. Please excuse the bad hair- taxi was running v late that day so had no time to go into makeup! OK, this is technically from December, but I just got a copy of it today! I’m quoted in Men’s Health Magazine giving gift suggestions for Christmas. -A rather unattractive picture of me appeared in New Media Age magazine to illustrate an article on Web TV Enterprises. -Another SKY News appearance, this time regarding the Gmail phishing scam and the language from the Stone Age. -Spoke on BBC Radio Manchester about the rise in gadgets aimed primarily at women, such as the Vivienne Tam digital clutch. Is being pretty worth an extra £100? -Appearing on SKY News to talk about stories moving across the web. See clip above. 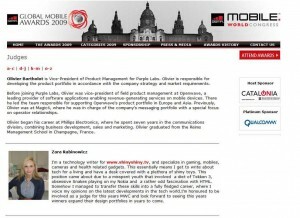 This year I judged the mobile gaming category for the GSMA Mobile World Congress 2009 .You can see my judge profile on the Global Mobile Awards 2009 page- but I can’t let you know the winner yet! Results will be revealed at MWC in February! 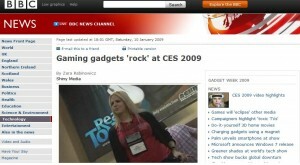 -At the Consumer Electronic Show (CES) 2009 in Las Vegas I did a segment with the BBC about some of the interesting gadgets on display. You can watch the footage here, and read the feature I wrote here. -Watch the clip of me on SKY News here. -Appearing on SKY News tonight talking about Hello Kitty Hospitals and why greeting cards are becoming more traditional. -Made a guest appearance on the BBC discussing what games will be hot for Christmas 2008 with John Houlihan from CVG. -Quoted in the Independent discussing the rise of beauty gadgets. It seems that beauty manufacturers are trying to attract the iPod generation by making sleek shiny devices. They might look good, but do they actually work? You already know that I think the Tria does, but with a plethora of new devices coming out, which are worth the money? Read my review on the No!No! Skin spot device here. -Featured on SKY’s Technofile programme as an expert guide to the Tria laser hair removal device.. for the HOME! Exciting, huh? Read the article here, or you can watch the video below. -Watch me on SKY here. -Appearing on SKY News to talk Obama cabbage patch dolls, and the new Wassup video that has been a surprise YouTube hit. -And here’s the clip from the SKY News show. -Appearing on SKY News to discuss trends and stories on the web. Check out my discussion topics here. -Bless her cotton socks- the Muse picked up on my Street Style piece. -Appeared on In Style in the Street Style Section whilst attending New York Fashion week. -I’m enjoying smashing up Xboxes in the park, courtesy of Nintendo’s Summer Atheletics. Watch me fail at throwing them on ITN here. -Quoted on SKY News commenting on LG’s netbook launch. -Quoted on SKY News discussing Microsoft Photosynth.